Sarcomenia delesserioides, pressed specimen (blades enlarged in inset). AD-A61614. For November, DEWNR has chosen a pair of neighbouring parks on Kangaroo Island as Parks of the Month: Seal Bay Conservation Park and Kelly Hill Conservation Park. The State Herbarium of South Australia has also chosen two Plants of the Month for November 2016. 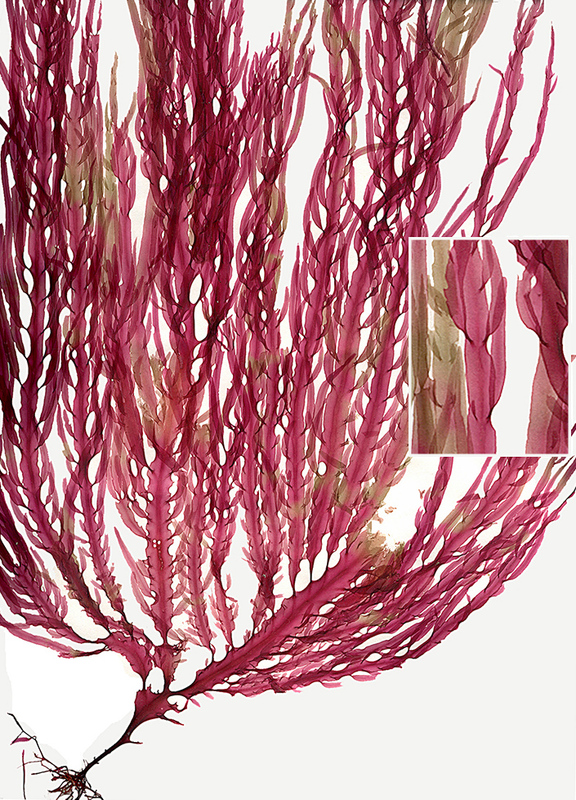 For Seal Bay, the Phycology Unit suggested the alga Sarcomenia delesserioides Sonder. Delicate, filmy, iridescent under water and self-destructive! 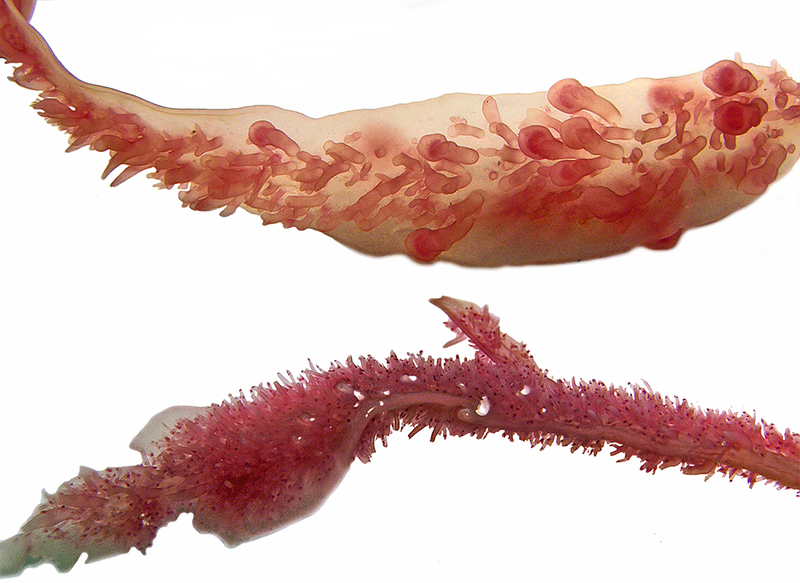 Sarcomenia delesserioides is a beautiful, translucent red alga found from the Abrolhos Islands, Western Australia to Victoria, often washed in from deep waters. It is difficult to preserve as it habitually dissolves itself when left to die slowly, leaving a sloppy mess on the paper sheet if its collector tries to press it in the usual way. Streamer-like narrow blades arise from a short stalk anchored by a root-like holdfast. Side blades on short stalks sprout from mid-line veins. Under a hand-lens, you can better appreciate the delicate beauty of the alga. Female plants produce a “forest” of glistening, minute, lollipop-like structures (cystocarps) on both blade surfaces. Sarcomenia delesserioides, female blades with cystocarps (top image) and male blade with stichidia (bottom). AD-A74861. Photos: B. Baldock. There are separate spore and male plants which produce miniature, finger-like reproductive structures (stichidia) that make blade surfaces look like furry tongues. Blade tips under a laboratory microscope show single, large, apical cells dividing to form mid-line veins and spreading lines of cells, produced in pairs with mathematical precision, that expand the blade width. As the blade matures and thickens slightly, additional surface cells form ring patterns around larger deeper cells. The first record of this alga in the State Herbarium is probably that collected by Jessie Hussey at Port Elliott, who was an avid collector of algae during the end of the 19th century. There are 17 specimens from the south coast of Kangaroo Island mainly from the Vivonne Bay jetty. Other collections come from drift or specimens “cast up”. We know the plant actually grows on rock at depth — 38 m — from a dive made off Cape Willoughby in 1989 (a collection that would be prohibited these days because of industrial safety regulations). Sarcomenia delesserioides, tip of blade (left image) and surface cells (right). AD-A18663. Photos: B. Baldock. Only two records of this exquisite alga from Seal Bay exist, from drift specimens taken by the late Professor Womersley way back in October 1966. Visits there in the 1950s (2), 60s (3 additional ones), 70s (3), 80s (1) and 90s (2) failed to find the species again. There have been no subsequent collections at the State Herbarium of any algae from southern Kangaroo Island localities, which reflects the penurious nature of algal field work in modern times. Does Sarcomenia delesserioides still exist in Seal Bay or its rocky environs? Have visitors noticed it and failed to recognise its uniqueness? Perhaps only a serious “algal watch” by local enthusiasts could answer these questions. The State Herbarium e-Flora has webpages that could help avid beachcombers. Try the Algae Revealed keys and information sheets on www.flora.sa.gov.au/algae_revealed/index.shtml. Contributed by Carolyn Ricci and Bob Baldock, Phycology Unit, State Herbarium. This entry was posted in The Plant Press on 25 October, 2016 by Jürgen.